Garden Adventures - for thumbs of all colors: Rain Gardens; Muddy or Magnificent? Can you spot the rain garden??? I have somewhat ambivalent feelings towards the concept of rain gardens. If you read my post ‘Don’t tell me about bog gardens!’ you’ll understand why I have a love-hate affair with water on our land…. At best I could only envision a swamp and I have 5 acres of that already! 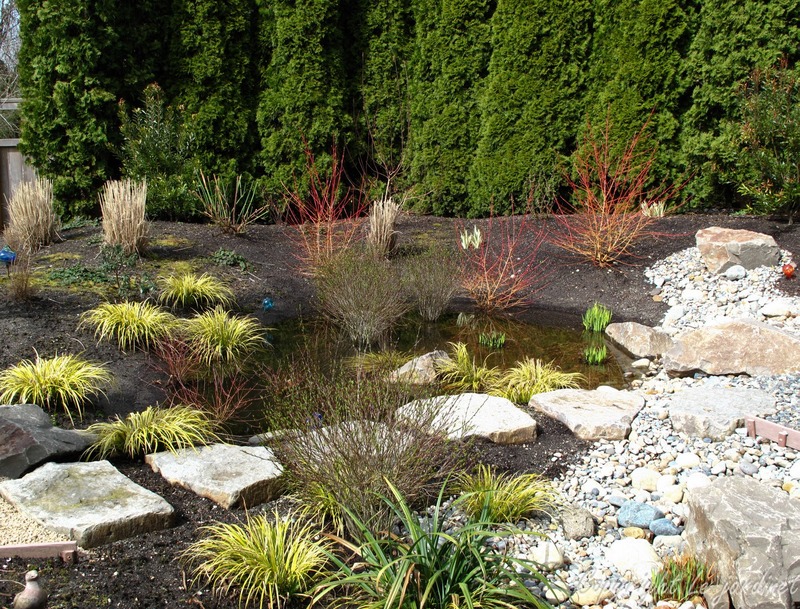 Rain gardens are depressions in the land placed in an area of well draining soil to which excess water can be diverted. That water can come from downspouts and/or surface water but by providing a place for the water to slowly seep down into the soil it reduces the amount of water entering our already overloaded storm drains. 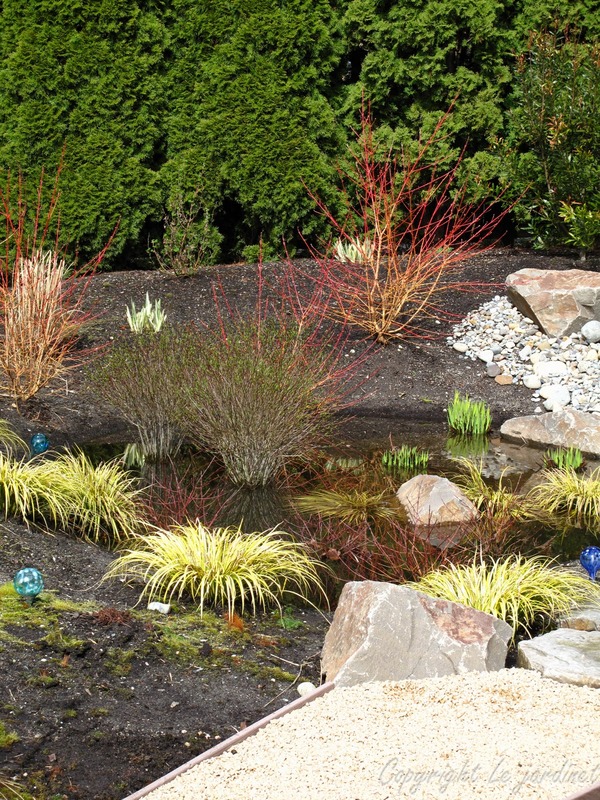 A bog garden on the other hand is purposely placed in a wet area but these two terms are often used interchangeably and from a design perspective the lines between the two are often blurred. 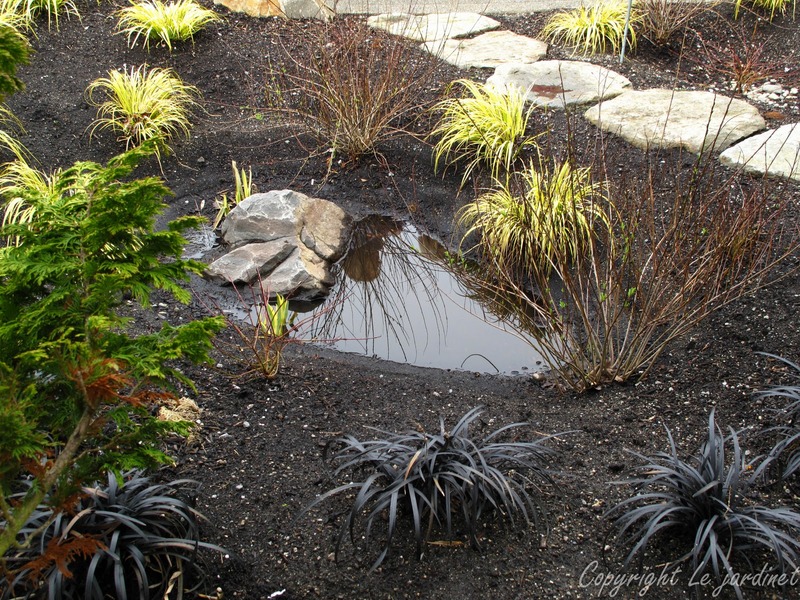 My interest in rain gardens was piqued after seeing a stunning design by Artistic Garden Concepts at the Northwest Flower and Garden Show in Seattle. It was elegant, artistic and most surprising of all, formal. I had envisioned these gardens as only being suitable for rural areas where a little untidiness wouldn’t matter. Nancy Claire Guth was the designer of this showpiece and when I heard she was planning a tour of local rain gardens which she had created I quickly signed up, prepared to re-think my prejudices. I asked Nancy how she got started designing these features. In the early days to contour the land she would raise up some areas into berms, improving drainage and adding topographical interest. The risk of this, however, especially on already poorly draining land was that the water would flood into the lawns or worse, into neighboring gardens. In order to prevent this she created small depressions in discreet areas as catchment basins. 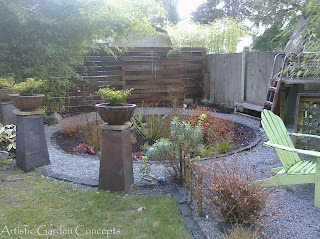 As time went on she learned to work with nature rather than against it and to make these garden features more architectural in nature, adding ‘landbridges’ (mini dams with stepping stones across the top), surrounding pathways and creating them as focal points rather than hidden puddles. To enhance their functionality runoff from roofs was also redirected into these depressions as needed. and shrubs add winter interest. Nancy took us to visit three of her residential installations and I was surprised that these were in well manicured upscale neighborhoods, the first of which also had a Homeowners Association (aka The Plant Police). If you have ever lived in such a community you will appreciate how challenging getting approval of landscape designs can be. The end result had to be functional, aesthetically beautiful and blend with the neighborhood. No muddy puddles here thank you very much! As if that wasn’t enough this first installation was in a front garden so it had to look really good year round. When Nancy first evaluated this site there was a noticeable boggy area in the front garden where the rain garden now sits. Rather than fighting the situation by the addition of a drainage system, Nancy made this into a focal point complete with an attractive observation area. I particularly loved the combination of gentle berms and shallow bowls, reminiscent of the rolling English countryside. To me this was key to the overall success of the design as it mimicked nature whilst a simple landbridge, pathways and seating area invited exploration and appreciation. 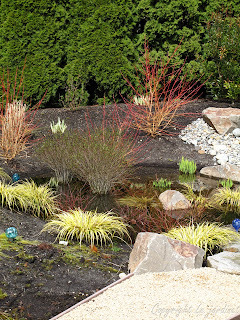 A medley of gold foliage sparkled in the boggy areas even on a dreary March afternoon and included the evergreen Japanese sweet flag (Acorus gramineus ‘Ogon’), variegated iris (Iris pallida ‘Aureo-variegata’) and the dwarf blue arctic willow (Salix purpurea 'Nana'). The surrounding berms allowed for plants which preferred drier feet, including a golden Hinoki cypress and a dark leafed spurge (Euphorbia). One of the surprises was that even in summer these plants thrived since although there was no standing water the soil remained moist. (In fact Nancy asked me to wait to photograph the gardens until summer when they would look ‘nice’ but to me the design was all the more impressive that it looked so good at this time of year; it was simply a change in personality). golden tones of the Acorus grass. Design by Artistic Garden Concepts. ﻿﻿The second home sat at the lowest point in the neighborhood, not only having to deal with its own run off but also that of all their neighbors. In addition the high water table allowed little soil for the water to drain into, something I can definitely empathize with. 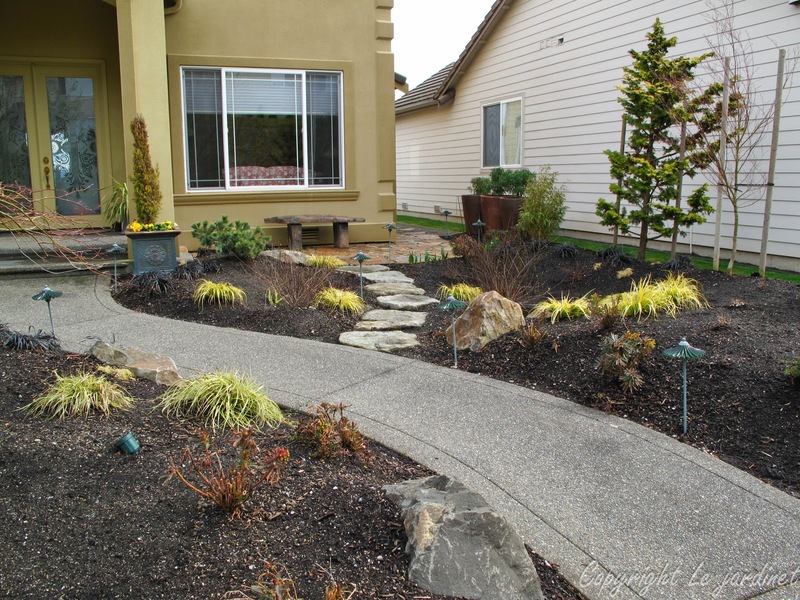 This rain garden was designed of necessity to handle a large volume of water and so a bypass valve was added to prevent flooding in extreme situations. However despite the Seattle monsoons of late the valve has remained open. of 'right plant, right place'. 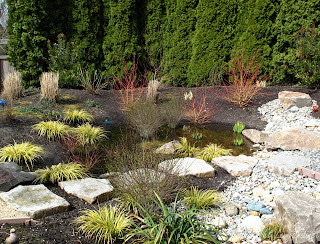 Again a series of berms surrounding the rain garden together with a landbridge topped with stone slabs created a feature as beautiful as any permanent pond yet instead of detaining the water as a pond does it simply retains it, allowing a gradual percolation. We visited after a week of rain so there were several inches of water present and it looked beautiful. Water loving plants were thriving and the surrounding patios and gravel paths made this a destination rather than the eyesore I feared. Our final visit was to Nancy’s home where her sense of fun shone through. She had replaced an old above ground swimming pool with a rain garden retaining the original circular shape. The roof gutter drains directly into this perfectly round depression which in turn has become her laboratory in which she experiments with different plants. Nancy said it looks like a giant salad bowl in summer with its tapestry of colors and textures. An adjacent circular fire pit and seating area finishes the scene and so what could have become an unused part of the small garden has become its main attraction. What’s next? Nancy is thinking of ways in which she can design an above ground water catchment system and have the overflow be directed into a rain garden. Many of us use rain barrels for example but have to divert excess water into the drains while larger scale water cisterns have historically been an eyesore. Wouldn’t it be great if we could divert that excess water, not just disguising the system but finding a way to create something beautiful and functional? If anyone can do it Nancy can. Rather than re-enforcing my prejudices, Nancy has really opened my eyes to the possibilities. What about you? Such lovely rain scapes!!! BRING IT ON, NANCY!! We have a drainage problem :) D.C.